The Nikon D810 is a DSLR for serious photographers only. Nikon's managed to squeeze a high powered top of the line camera in a relatively small, rugged frame. Featuring a 36 megapixel FX-format sensor, an Expeed 4 image processor, active vibration reduction and correction, full 1080p video, and ISO ranges from 64 - 12,800 expandable to 51,200, the D810 is one of the heavyweights of the DSLR market. While it's not a huge step up from the D800E, the D810 brings a lot of compelling updates that manage to improve speed, quality, and battery life. Improved continuous shooting, better ISO ranges, and faster frame rates for HD videos are only a few of the ways the D810 manages to stand out. Professional photographers will be more than pleased by what they find in the D810. Despite Nikon's attempts to maintain compact DSLRs, the D810 is a beefy camera with a 5.8 x 4.9 x 3.3 inch body and a 31 ounce weight. However, the D810 has a tough magnesium alloy body with protection against dust and weather, as well as a comfortable and grippy surface that will prevent the camera from slipping out of your hands. As with Nikon's other DSLRs, the controls are intuitive and comfortably manipulated while holding the camera. 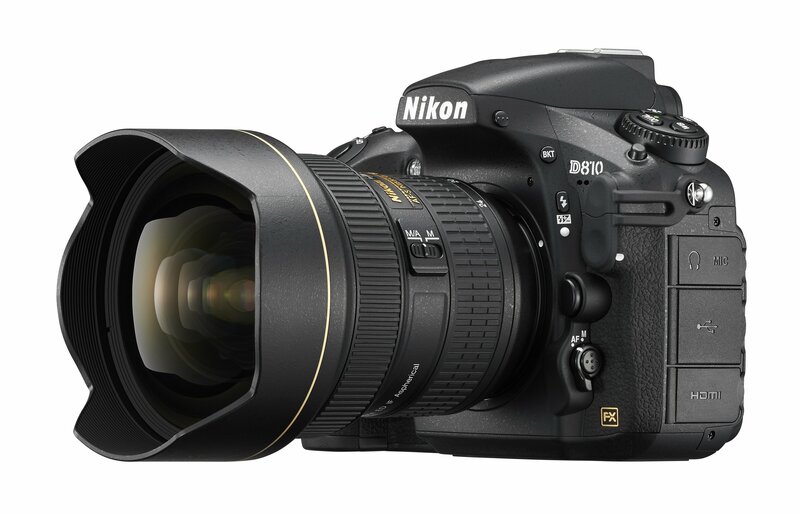 The D810 takes stunning 36 megapixel images more quickly and with less noise than Nikon's previous offerings. The Expeed 4 image processor lets the D810 take 60fps 1080p video, photos with improved autofocus, and autofocus during live preview, all while using less power than the Expeed 3. The D810 has a shutter speed of 1/8000 seconds with a continuous shooting speed of up to 5 fps. The D810's autofocus uses 51 AF points to track objects even in poor lighting conditions. The D810 has much improved video capture support than other DSLRs, maxing out at smooth 60fps 1080p video. The D810 can record simultaneously to SD and to an external recorder, while the built-in stereo microphone manages a surprisingly high quality of sound. The D810 takes 1,200 pictures and roughly 40 minutes of video between charges, up from the D800E's 900 shot battery life. The Expeed 4 processor vastly improves the performance of the D810 while improving on the quality of pictures and videos. As with Nikon's previous DSLR's, Wi-Fi can be added with the use of an add-on. The D810 isn't a monumental improvement over the D800E, but it's enough to win over any professional photographer looking for the best of the best. The crystal clear image quality, ease of use, and feature set of the D810 make it a far better professional DSLR than its competitors. Beginners and intermediate photographers, or users who are looking for extra features such as GPS, may want to look elsewhere. 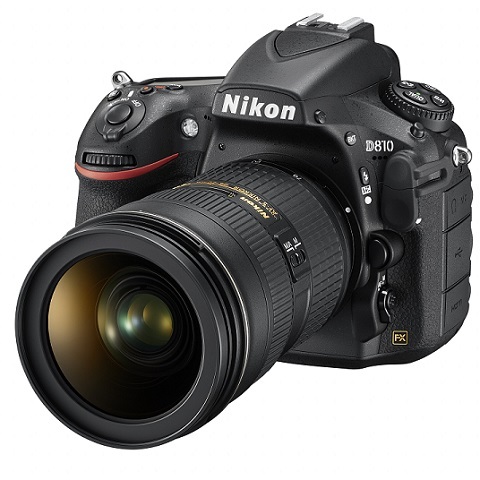 The Nikon D810 is a DSLR for serious photographers only. Nikon’s managed to squeeze a high powered top of the line camera in a relatively small, rugged frame. Featuring a 36 megapixel FX-format sensor, an Expeed 4 image processor, active vibration reduction and correction, full 1080p video, and ISO ranges from 64 – 12,800 expandable to 51,200, the D810 is one of the heavyweights of the DSLR market. While it’s not a huge step up from the D800E, the D810 brings a lot of compelling updates that manage to improve speed, quality, and battery life. Improved continuous shooting, better ISO ranges, and faster frame rates for HD videos are only a few of the ways the D810 manages to stand out. Professional photographers will be more than pleased by what they find in the D810. Despite Nikon’s attempts to maintain compact DSLRs, the D810 is a beefy camera with a 5.8 x 4.9 x 3.3 inch body and a 31 ounce weight. However, the D810 has a tough magnesium alloy body with protection against dust and weather, as well as a comfortable and grippy surface that will prevent the camera from slipping out of your hands. As with Nikon’s other DSLRs, the controls are intuitive and comfortably manipulated while holding the camera. The D810 takes stunning 36 megapixel images more quickly and with less noise than Nikon’s previous offerings. The Expeed 4 image processor lets the D810 take 60fps 1080p video, photos with improved autofocus, and autofocus during live preview, all while using less power than the Expeed 3. The D810 has a shutter speed of 1/8000 seconds with a continuous shooting speed of up to 5 fps. The D810’s autofocus uses 51 AF points to track objects even in poor lighting conditions. The D810 takes 1,200 pictures and roughly 40 minutes of video between charges, up from the D800E’s 900 shot battery life. The Expeed 4 processor vastly improves the performance of the D810 while improving on the quality of pictures and videos. As with Nikon’s previous DSLR’s, Wi-Fi can be added with the use of an add-on. The D810 isn’t a monumental improvement over the D800E, but it’s enough to win over any professional photographer looking for the best of the best. The crystal clear image quality, ease of use, and feature set of the D810 make it a far better professional DSLR than its competitors. Beginners and intermediate photographers, or users who are looking for extra features such as GPS, may want to look elsewhere.